Proceeds Will Be Used to Update Electronic Resident Quality Care Management Systems. 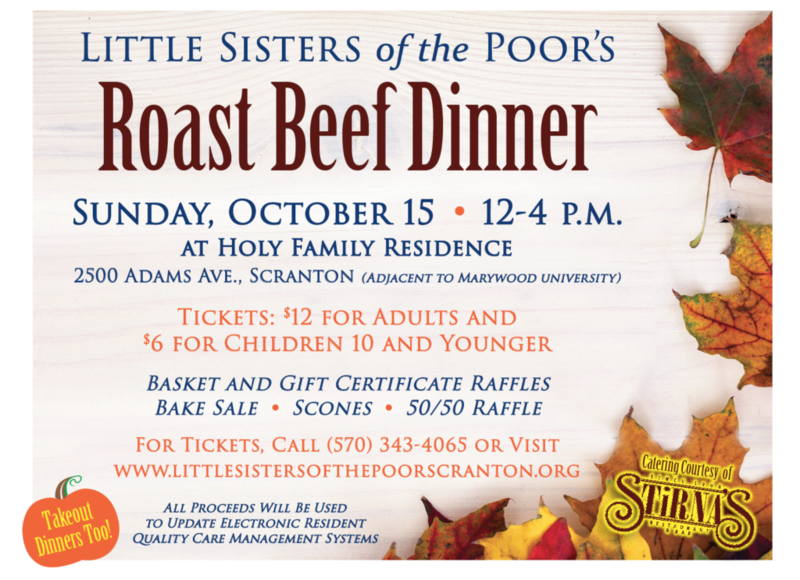 The Little Sisters of the Poor will have their annual Autumn Roast Beef Dinner from 12 to 4 p.m. Sunday, Oct. 15, in the auditorium of Holy Family Residence, 2500 Adams Ave., Scranton, located adjacent to Marywood University. All proceeds will be used to update electronic management systems to provide continuous and integrated quality care for the residents of Holy Family Residence. The dinner, which will be catered courtesy of Stirna’s Restaurant, includes roast beef, mashed potatoes and gravy, carrots, rolls and butter, assorted pies and beverages. Takeouts will be available too. Tickets are $12 for adults and $6 for children 10 and younger. Tickets can be purchased in advance by calling (570) 343-4065, online at www.littlesistersofthepoorscranton.org or at the Residence. They also will be available at the door. In addition to the dinner, there will be a bake sale which will include the Sisters’ famous homemade scones and an assortment of other baked goods. There also will be raffles for gift baskets and gift certificates for area restaurants and businesses as well as a 50/50 raffle. The Little Sisters also have numerous dinner sponsorship packages available which are great advertising vehicles for businesses as well as a way to honor or remember a loved one. For advance ticket purchases and sponsorship information, please contact Mrs. Jackie Galvin, M.S., director of development and communications, at (570) 343-4065 ext. 3144 or scdevelopment@littlesistersofthepoor.org.